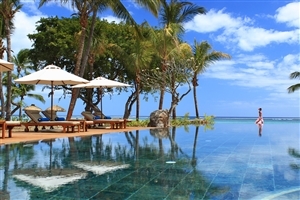 The award-winning Hilton Mauritius Resort & Spa brings the world-renowned Hilton brand to the sumptuous west coast of Mauritius in the picturesque village of Flic en Flac. 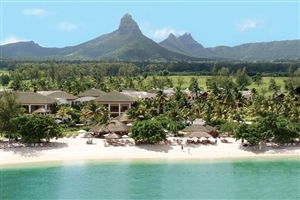 Inspired by Mauritius’ African and Asian heritage, Hilton Mauritius Resort & Spa offers a fine blend of relaxation and stimulation, from the comfortable, well-appointed accommodation, to the rejuvenating Spa, to the excellent choice of dining experience available in three fabulous restaurants. With its pristine beach setting and generous facilities, Hilton Mauritius Resort & Spa is the perfect choice for a dream Mauritius holiday. 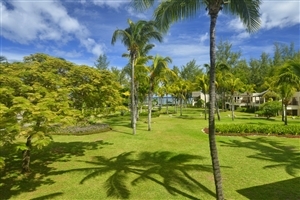 Located in immaculate, landscaped gardens, directly on a three kilometre stretch of powder white sand beach and protected by the lagoon, the Hilton Mauritius Resort & Spa is a veritable gem. 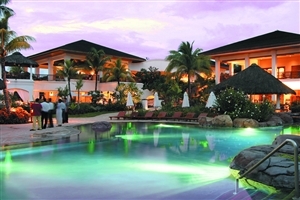 Just five minutes from the lively village of Flic-en-Flac, its warm and friendly ambience makes this resort extremely popular. Facilities here are in abundance; enjoy the numerous watersports available from the Boathouse, a game of tennis on one of three courts, or simply relax in the spa. 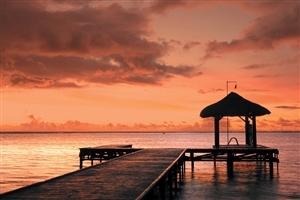 All rooms here face the sea, so guests can also enjoy the beautiful Indian Ocean sunsets. This family friendly resort is a haven where children can swim in the calm shallow waters or enjoy the games on offer in the kid's club. There are also many attractions in the surrounding area including a popular bird park and crocodile farm. 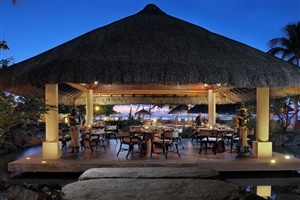 In the evening, guests can sample traditional Mauritian or international cuisine at the resort or discover the nightlife and attractions of Flic-en-Flac. The Deluxe Rooms at Hilton Mauritius Resort & Spa offers 43sqm of accommodation space overlooking the Indian Ocean from the standard balcony. All Deluxe rooms are available with a work desk and marble bathroom, plus the choice of a king-size bed or two twin beds. The Grand Deluxe Rooms at Hilton Mauritius Resort & Spa offers 43sqm of accommodation space elegantly designed with modern decor and furnishings. 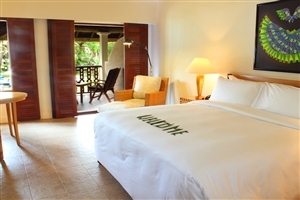 The room features a private balcony or terrace that boast gorgeous sea views. The Beachfront Junior Suite at Hilton Mauritius Resort & Spa offers 61sqm of accommodation space, including a spacious balcony overlooking the Indian Ocean. All Junior Suites feature large windows for an airy interior, a work desk and a marble bathroom. The Corner Suite at Hilton Mauritius Resort & Spa offers 74sqm of accommodation space and is located in the corner of the resort overlooking the Indian Ocean. The Corner Suite features separate bedroom and living room area, plus two bathrooms. 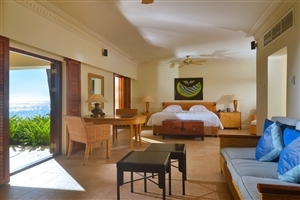 The Deluxe Family Suite at Hilton Mauritius Resort & Spa offers 92sqm of accommodation space, including a separate bedroom and living room, plus a large balcony from which to enjoy pleasant views. Special touches include bathrobes, flowers and fruit on arrival. 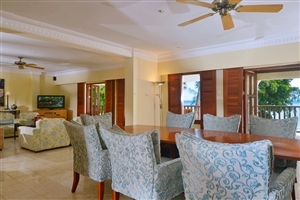 The Senior Suite at Hilton Mauritius Resort & Spa offers 105sqm of accommodation space, including a large living area that provides direct access to the ivory beach and Indian Ocean. The Senior Suite also includes a dining area and seating area to relax, while marble bathroom includes a walk-in shower. 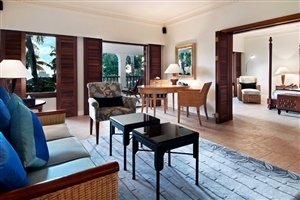 The Presidential Suite at Hilton Mauritius Resort & Spa offers 208sqm of accommodation space, including a separate living room and bedroom, a dining room, a kitchenette and spa, plus a second bedroom and bathroom. Watch DVDs on the standard television and take advantage of the relaxing Jacuzzi when staying in this spacious and plush suite. Les Coquillages – Gourmet restaurant located on the beach edge, ideal for enjoying lunch feet in the sands and dinner under the stars. 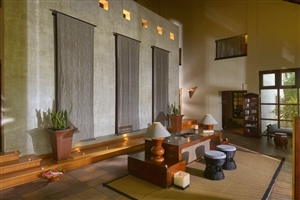 Vista Bar – Enjoy cool drink and snacks in a relaxing lounge atmosphere nestled between the main pool and the beach.